On Sale Through April up to 41% off (LINK)! 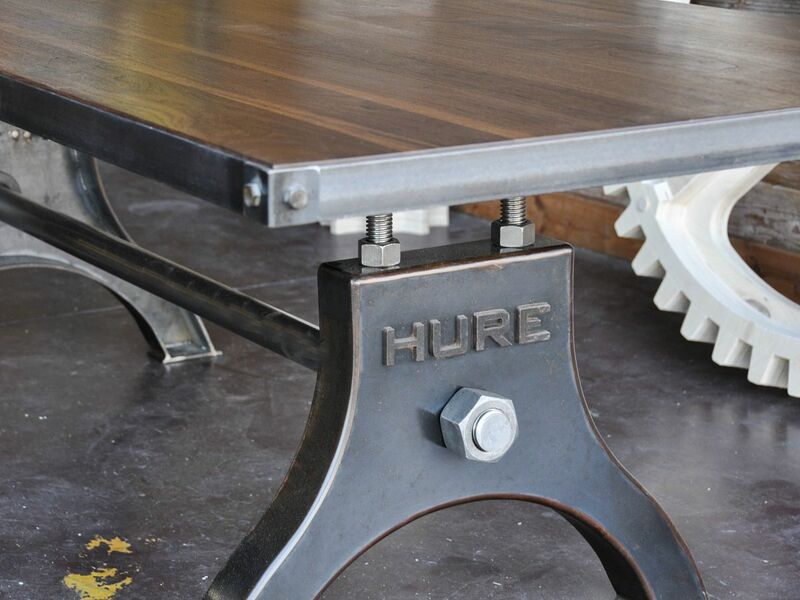 The Hure Table was inspired by a love of the old cast iron bases made from the late 1800s to the 1940s. A French machinist named P. Hure built many different lathes and milling machines that stood on bases like these. They are rare and very hard to find – especially in America – so we built this base as a tribute to Hure’s designs (story here). Entirely handcrafted, these tables are rich in character and elegance with massive yet curvy lines. The base is built with 1/4″ thick steel in the heaviest gauge we’ve used to date. The large connecting screw has a 2″ diameter with a 3″ nut that holds the two bases together. The Hure is equally at home in a residential or commercial setting, from dining table configuration to conference table to restaurant use. The Hure Table can be ordered in a choice of metal or wood tops: LINK It is an adaptable design that can be customized to a wide range of specifications to fit your individual commercial or residential needs (contact us). For more information, please see Product Details below. Base price includes a 96″ x 40″ steel top in dining height. All the way from Ontario Canada I thought my love and hope of ever finishing my kitchen with a HURE table was just a dream! There was no way we could get one to Canada without spending a fortune. But!! Much to our happiness we made it happen. Dealing with Frank in designing and customizing our Faux Crank table base we learned that getting it from Arizona to Ontario was doable!! The process was flawless. The team was amazing to work with and today with our table actually in our own kitchen it’s a dream come true. 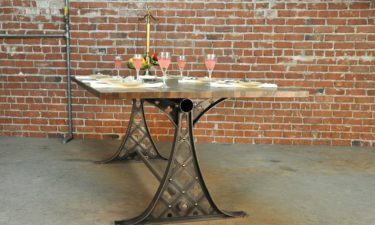 We love love love our table and it is all that we imagined and more! We can’t thank the team enough for guiding us through this process until our table reached our home!! Highly recommended. The quality and craftsmanship comes at a high level and this will definitely be the show piece to our kitchen for years and years to come! Thank you to the team again!! We purchased this table on clearance and are super happy with it. Great sales service, quick response, quick delivery, professional service & communications every step of the way. Thank you for your professionalism, responsiveness, and service. Will highly recommend you guys. We’ve done so already. 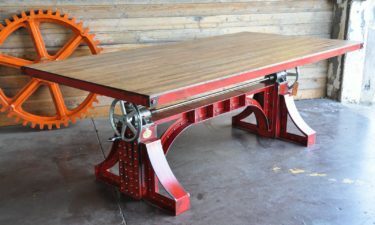 I found Vintage Industrial online while looking for a conference/dining table for my small business. I had been searching for just the right table for over a month. 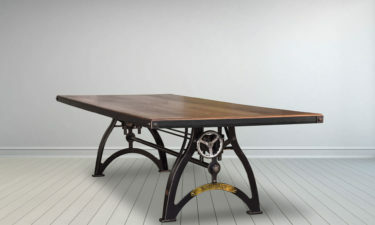 Once I found Vintage Industrial and saw their tables I knew I had found what I was looking for. The wife and I had already planned a short vacation to the Phoenix area so once I saw Vintage Industrial was in Phoenix I called Greg to see if I could come by and see wood options in person. A few weeks later Greg met us on his off day and gave us a tour of the Vintage Industrial facility. We chose the wood and finalized the order. 60 days later, I could not have been any happier when the table arrived. 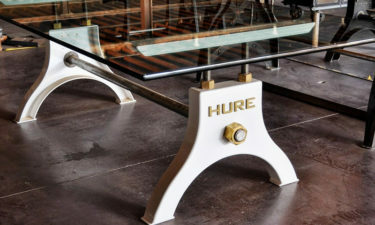 Greg sent final photos of the HURE Table and said photos do not do it justice, wait till you see it in person. Boy, was he was right. The most absolutely beautiful table I have seen. When you look underneath the table you can really see the craftsmanship – pure perfection. 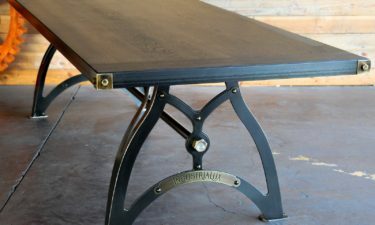 The quality of Vintage Industrial tables are top notch; I can’t imagine a better-made table. These guys know what they are doing. Their products are worth the price. Our new table is an heirloom piece! Simply beautiful table! As a designer I have the opportunity to work with many furniture suppliers, wholesalers and custom fabricators. Vintage Industrial has been an absolute pleasure to work with from the initial stages of the project to its’ completion. Knowledgeable, efficient and courteous service combined with attention to detail and pride in their product ensures that they are in a class of their own. The quality and aesthetic appeal of their designs is second to none – I look forward to working with them on future projects! Our custom made Hure is 4′ by 10′ with a steel top, so we have plenty of space for family and friends. The design is exactly what we wanted for our new home. The top is toddler proof and so easy to clean… it’s not often you can get a new table and not worry with smaller kids sitting at it. We love it! I found this company by accident, I loved their pieces even before I even knew they were a local company. The process is fantastic, they keep you involved every step of the way. You can make each piece EXACTLY what you want it to be. The cool unique product and process makes you feel very special. The finished piece was just as beautiful as I thought it would be! It took about 5 weeks and was well worth the wait. I can’t wait to order my next piece in the fall!